As the nights grow longer here in Seattle riding in the dark is something you have to get used to. Lights and reflective accessories aside, I like the dark. I love pedaling near Lake Washington and seeing this vast dark space of the water and the glittering bridges that cross it. I like taking the dark roads, the ones with few street lights and good chances for owl encounters. That being said there are those spooky moments, when you hear a startling sound. The tell-tale rumblings of an impending flat tire on a dark moonless night. Here is my ode to those moment from Pedal, Stretch, Breathe. Happy Halloween! The other day I was biking home and decided, like I most often do, that I would prefer the slightly longer, windy road that leads up the backside of the hill. I am drawn to the winding curves of the switchback road instead of a beeline straight up. It is also home to one of my favorite spots in Seattle proper, the Louisa Boren Denny memorial stone on Interlaken Blvd. In the 1890’s City Engineer George F. Cotterill was scouting out good routes for bikes and buggies. Interlaken was established as the primary route between Capitol Hill and Lake Washington. This road was specifically designed with cycling in mind, as well as to capture splendid views. It was these bike routes that laid the foundation for the city’s Boulevards. In 1913 the adjacent park was named after Louisa Boren Denny, the last remaining pioneer from the Denny Party, the white folks who “founded” Seattle. About midway up the hill there is a memorial stone placed to honor Louisa by the Washington Women’s Pioneering Organization. I’ve always been drawn to the that stone and not only because it is a great place to stop for a water break. This admirable pioneer woman was interested in a variety of subjects including philosophy, chemistry and botany. Legend has it that she brought her beloved sweetbriar rose bush all the way from Illinois to Seattle. The lovely and aromatic rose can be found growing along the shores of the Puget Sound today. Riding a bicycle on these historic routes connects to me to the history of this place and the Pacific Northwest plants surrounded the streets. And in summer I love to nibble on the blackberries fighting to claim road space. They are not the native variety, but I guess me, Louisa and the Blackberry and all have that in common. Part of what makes riding a bike so wonderful is I can take the most beautiful routes around town. Instead of fighting through the traffic downtown and taking the (albeit very nice) buffered bike line across the bridge to run errands, I can cut through the park and take the bike path. In the dark moonless nights riding on the crumbling road stirs sound of an impending flat tire. You stop to check, but alas your wheels are fully inflated. 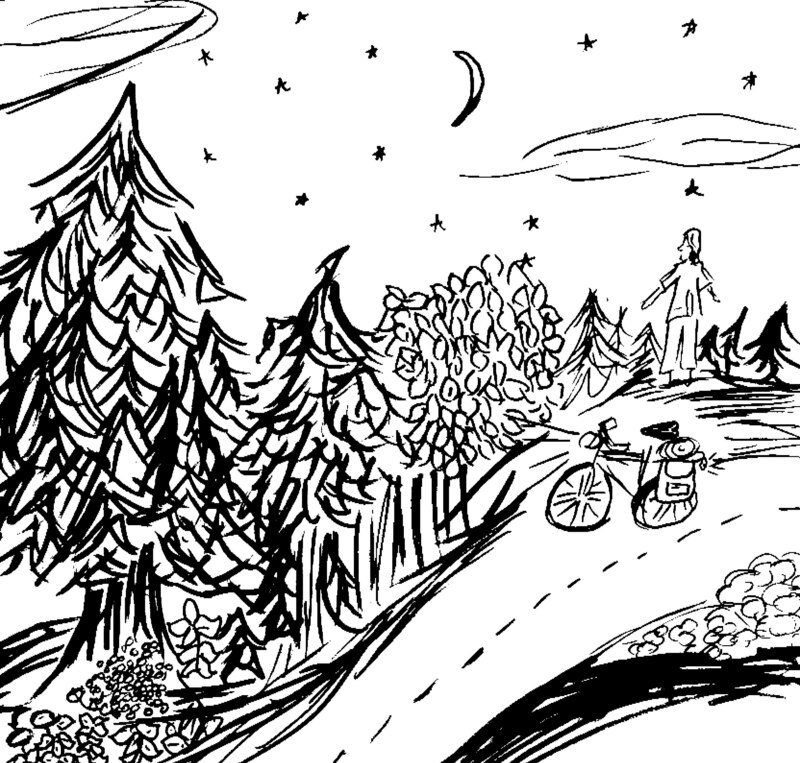 So you ride on, but the sound of ghost flats will haunt you until you reach the top of the hill. It is like riding in the tracks of all the people who have biked here before you. Yoga is a practice that offers something for everyone, no matter your age or ability. I am really excited to announce two new classes starting this September, one is for beginners who have never practiced yoga before and the other is Kid’s Yoga. To Register email me: Kelli.refer@gmail.com or show up at class! To Register call: (206) 386-1245 or show up on the first day of class! 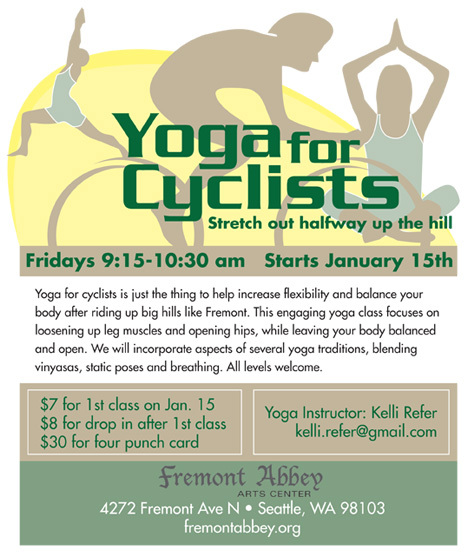 Yoga for cyclists is just the thing to help increase flexibility and balance your body after riding up big hills like Fremont. This engaging yoga class focuses on loosening up leg muscles and opening hips, while leaving your body balanced and open. We will incorporate aspects of several yoga traditions, blending vinyasas, static poses and breathing. All levels welcome. Fridays 9:15 – 10:30 a.m.